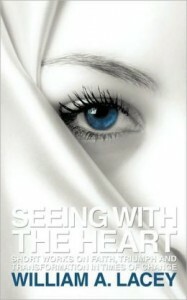 The Award Winning Book, "Seeing With the Heart"
By William A. Lacey, creator of the inspirational program, WillUnite: Light of a New Generation. A short book that packs a powerful message... Seeing With the Heart describes how our struggles, faith, and ultimate triumph in challenging times can transform us in ways we never imagined, enabling us to become sources of light, strength, and inspiration to others. Through his reflections on the holy seasons, original essays and inspirational verses, William Lacey illustrates how our personal trials can lead us to a new perspective that aligns with God's, through which we gain spiritual sight, enabling us to see as the Lord does; that is, seeing what is truly essential in others by seeing with the heart. Thus, our faith is rewarded with the gifts of deeper purpose, compassion, and joy. published in Christian publications and national news. In addition to possessing a professional background in corporate communications, William has experience in human services, where he worked as a mental health counselor, job developer and business skills teacher for both adult and youth populations with disabilities. William is also a former professional musician and percussion instructor. As an enriching addition to the acclaimed book, ﻿Seeing With the Heart, ﻿ this companion book provides you with the spiritual space for personal reflection. The series of thought-provoking questions contained in the book will inspire you to open your heart to a higher self-awareness and a deeper connection with God and with others. This is your invitation to create greater happiness, fulfillment and love in your life.